- reposition the image on the screen, scaling it up or down and sliding it left and right, etc as we showed in an earlier image test. - color correction, brightness/contrast, etc in order to work better with stage elements. NOTE ON RENDERS: These renders are very low resolution and "wire frame" quality in order to gauge camera movement and speed only. Obviously the still frames from the last review indicate the quality of the final renders. 1) FIERA FULL RENDER: this shows all the camera positions and moving camera transitions in the show, but leaves out the roller coaster ride itself. 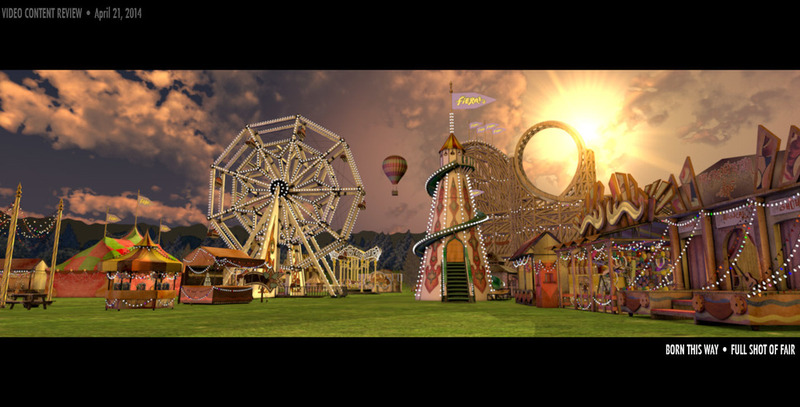 2) ROLLER COASTER : You've already seen speed and timing in an earlier render, this shows a little more detail of the world of the fair that is visible from the roller coaster -- we've put additional rides, booths, and trees around the coaster. 3) FERRIS WHEEL TEST: this shows one full rotation of the wheel and indicates the placement of the physical stage bench. I've started it 2 feet from the floor and had it travel about 3 feet higher during the ferris wheel. For now just ignore that when we are traveling down the ferris wheel you still see the central axel and interior beams of the ride -- we'll have to finesse how we hide these and make it a smooth transition to "inside" the wheel of the ride. Right now the time we have allotted at the end of the show allows for the wheel to go up to the top of the wheel before curtain if the wheel turns at this speed. We started with a simple object first instead of one of the rides to get feedback on the environment and overall look. Three images of a tent to show the sun, sky, ground, overall render quality, and colors/materials. The rides and objects in the scene are just rough placeholders so we can get a sense of the overall layout and camera moves. This mockup shows each of the camera positions and the movement between each camera position. 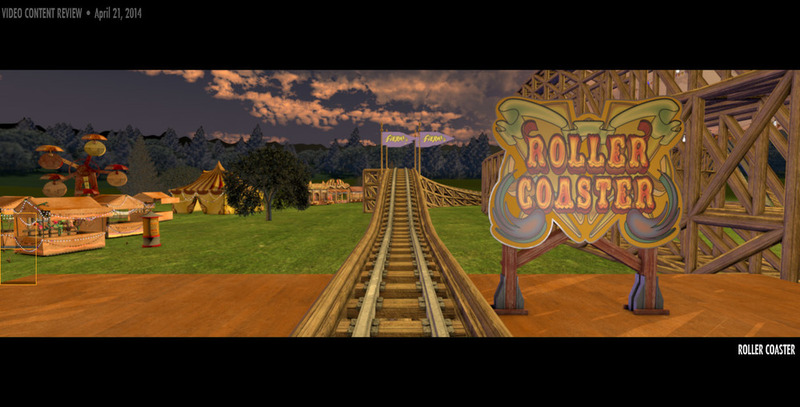 This mockup shows the path of the roller coaster designed to match the song and movement of the dancers. Here are some options for feedback. The gray shape shows the placement of the set piece. These images show the different sky and brightness for the section 2 of the show (after the Baby Contents and into the storm) and section 3 (the very end into the Ferris Wheel). The idea here is that in section 2, clouds have covered the sun and it will get even darker for the actual moment of the rain storm, and for section 3 is that the clouds have cleared, but now the sun has dipped below the horizon and the lights of the fair are most visible. This is an idea for the fabric of the interior of the gypsy tent -- I based it off the stage models. See the image on it's own plus put into the stage model mockup to see context. The fabric strips unroll from the top and would sway in the wind. A render for feedback. This would take place over the fabric of the gypsy tent, and cast light onto it. We would swap the static silhouette with a moving image of the actor.